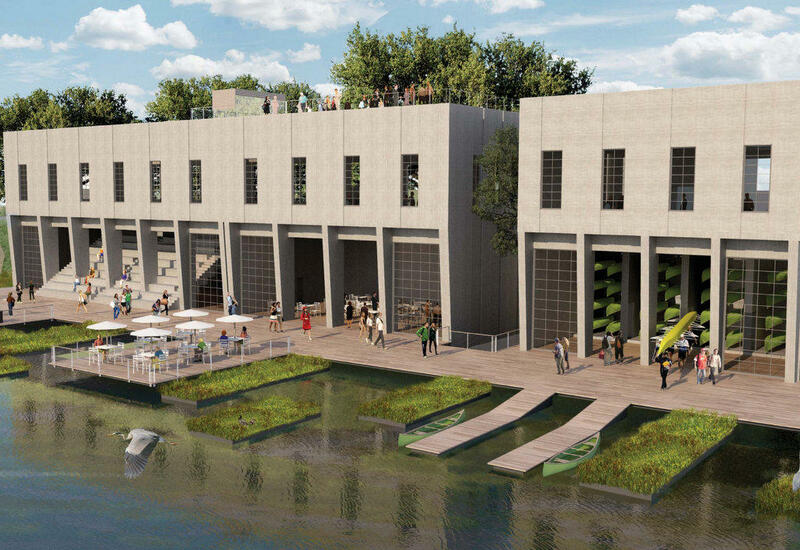 BOKA Powell + Design Workshop’s “Lakehouse” includes an event deck on Lady Bird Lake. Gumbully's "Link" design envisions Seaholm as an art museum while also highlighting the area's natural environment. 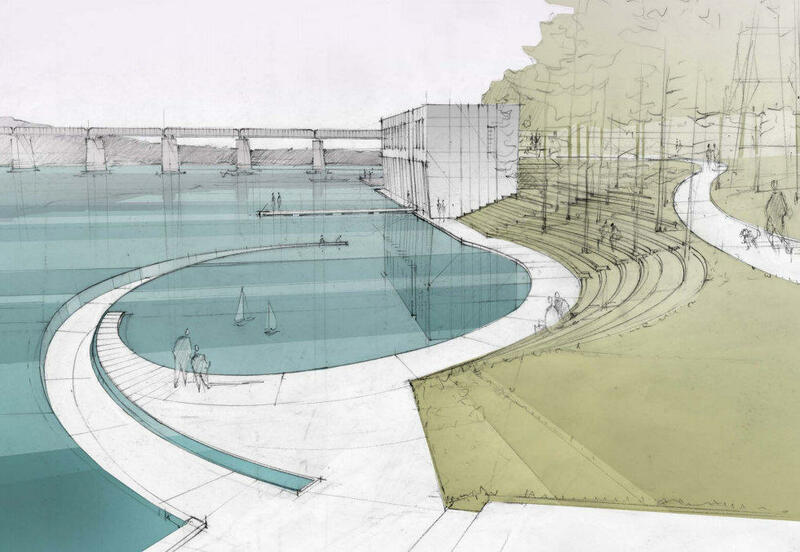 Gensler's "Intake" design, and its wading pool, made the cut for the final three. 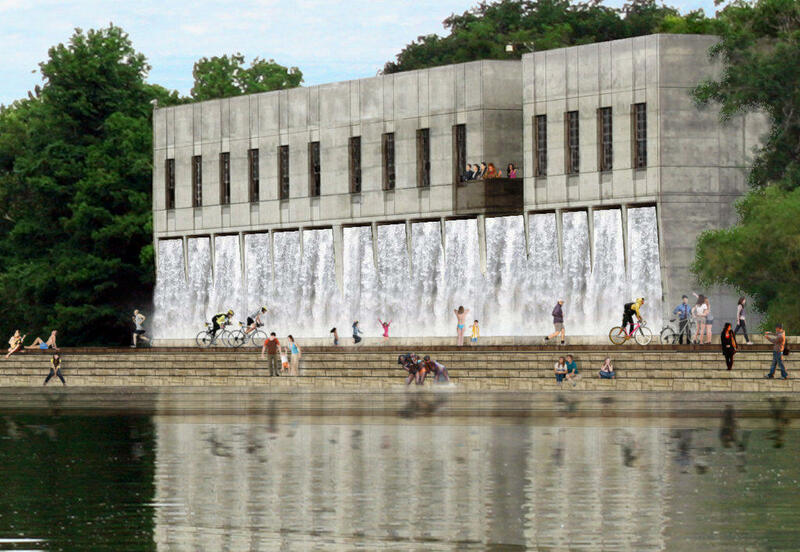 Update (Aug. 2): Have you checked out the 10 proposals for the Seaholm Intake Structures? If so, now you can rank them from best to worst. The city is looking for feedback on its Speak Up Austin website. There, you can rank the 10 proposals from favorite to least favorite. You can also leave comments regarding specific thoughts on the proposals. You can view large posterboard displays of the projects at City Hall through the end of today. The city will announce its top three designs on August 9. Original story (July 30): The Seaholm Intake Structures were once the pump house to get water from Lady Bird Lake to the Seaholm Power Plant. But when the plant was shuttered decades ago, so were the intake structures. But soon, like the construction at the former power plant site, the intake structures will see a change. 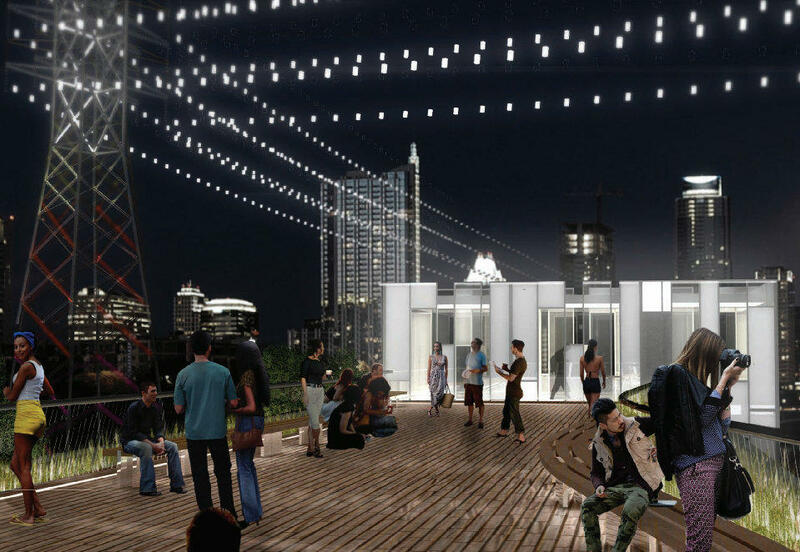 Earlier this year, the City of Austin asked for ideas on how to reimagine the structures. Out of 76 submissions, the city released its top 10 design plans yesterday. Here’s a look at what’s proposed. The Paddle Up Brewery, or PUB*ATX, focuses on making the Seaholm Intake a meeting place containing – what else? – a craft brewery. 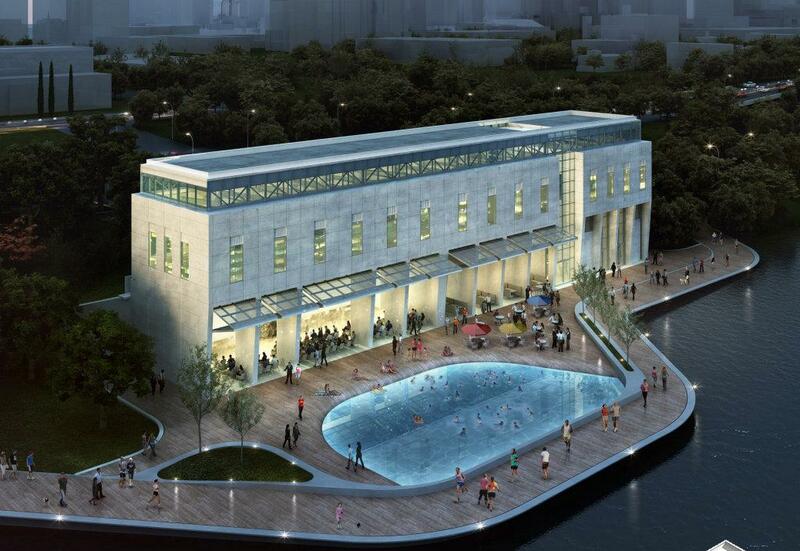 Other features in the design from Gensler include a café, art patio, amphitheater and kayak rentals. This vision from Gumbully's sees potential to expand Austin’s visual art scene in the Seaholm space. 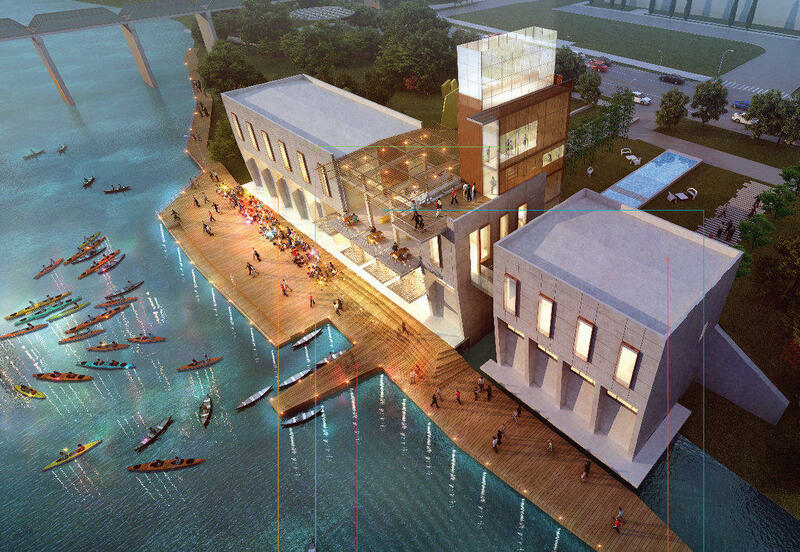 Although the plan has multiple art exhibits, the design utilizes the natural environment around the building, allowing patrons to kayak or paddleboat through art displays. 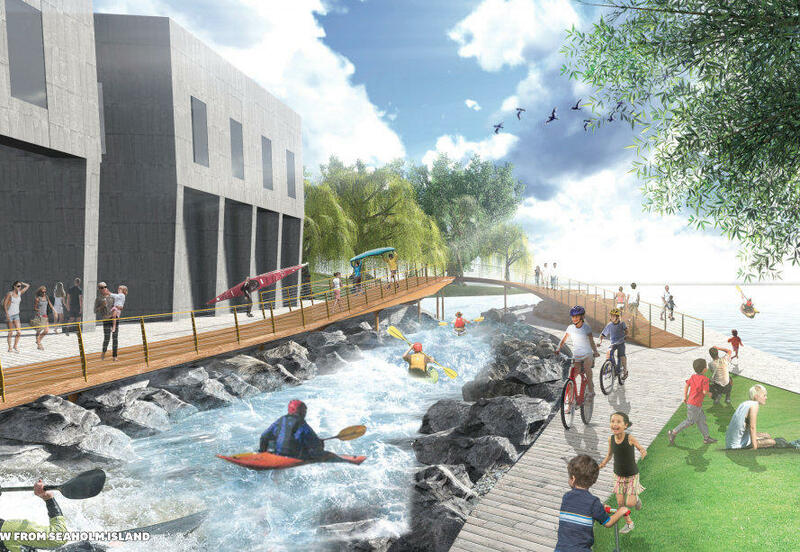 The Healthy Environment Collaborative proposal is for bikers, yogis and kayakers, but also for those who just want to grab lunch in the garden. With a yoga platform that doubles as a stage and showers for commuters that work nearby, the group has also come up with an extensive plan to create more bike lanes on nearby streets. Danze Blood Architects teamed up with Mell Lawrence Architects to create a more minimalist plan. The idea is to preserve the nature surrounding the space in order to have contemplation, sunbathing and picnics. The provided entertainment will be in an amphitheater facing the lake. If you’ve ever wanted to cool off without getting into the lake, this second design from Gensler possibly has the solution. 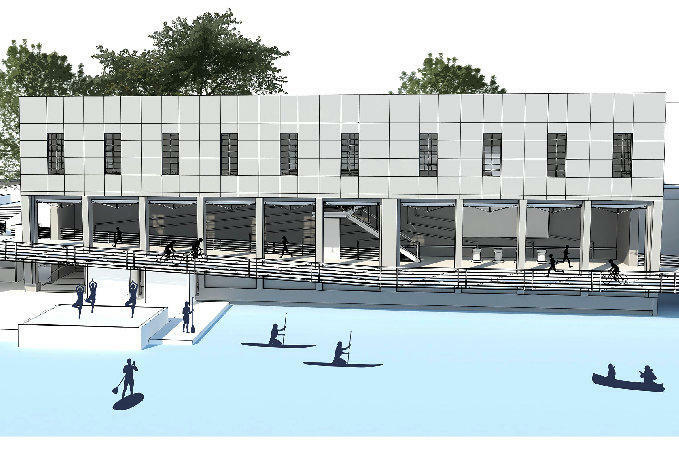 Named "Intake," the plan envisions a sustainable glass box inside the building to allow more natural light and access to the river and Cesar Chavez. 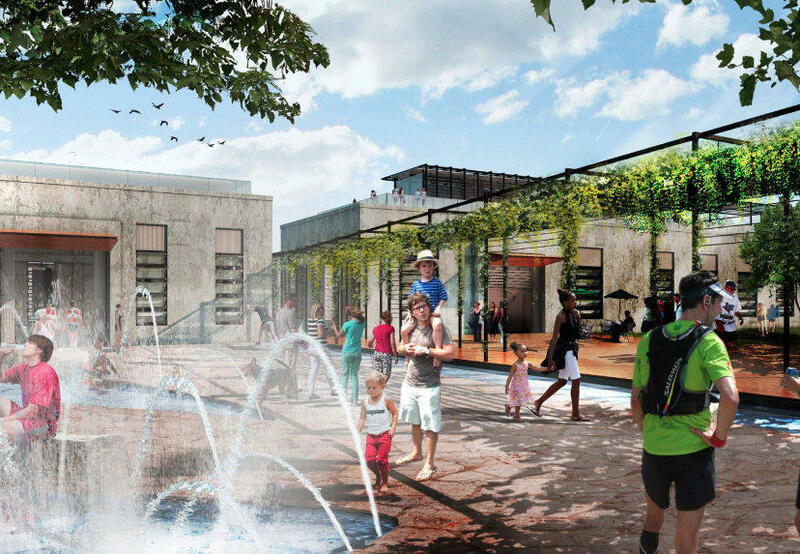 Intake would house a farmers’ marketplace on the main floor, a hike-and-bike trail and, most notably, a wading pool. KSEStudio created a plan that would serve mostly as a park with a moving platform for concerts and festivals, a water playground for children and a small pool. There would also be a rock climbing wall, café and an elevator. The Lakehouse, aka the Queen of the Eco-District from BOKA Powell, is exactly as it sounds. 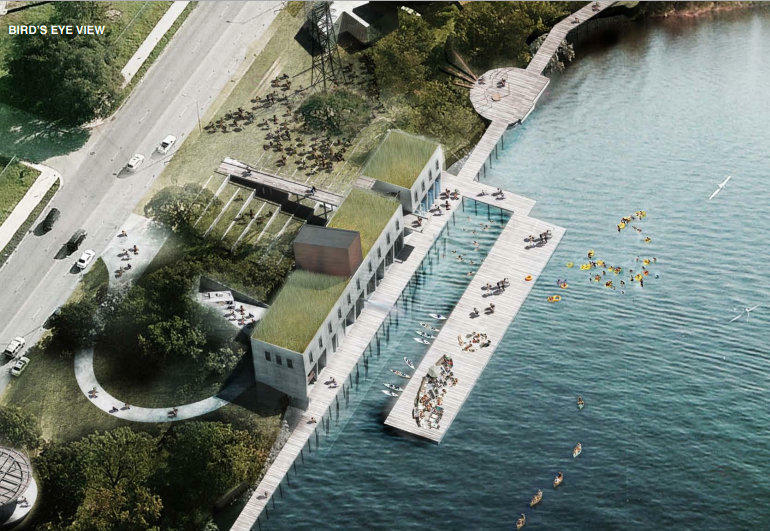 It uses wind and solar energy and provides an urban beach, hammock grove and a kayak café. The Rain Gardens and the event deck are also eco-friendly. Austin has a few lakes, but it doesn’t have a waterfall like this. Sadi Brewton & Jonathan Davies from 5250 have proposed a waterfall that overlooks the lake with a balcony. The plan also includes a trail, transit stop and event hall. The plan by Surroundings makes treating urban runoff a process you want to look at. The floating wetlands surround a covered stage and nearby decks. The “farm to table” restaurant or the community space can be a place to cool off after kayaking or sunbathing. Water lovers will enjoy the reef and new water accessibility in the proposal from Team CS. The pedestrian bridge offers a safe ride for commuters, while the plan also includes sustainable protection for the water. Rock climbing and a kayak dock provide for active entertainment or you could go to the rooftop garden to relax. Austin City Hall will have a display of images of the top 10 designs through Aug. 2. The top three designs will be announced on Aug. 9, with the winning design to be incorporated in the structures’ redevelopment some time afterward. Can the Lowly Alleyway Transform Downtown Austin? Why is Austin considering an alley "master plan?" When you think about downtown Austin, do you ever think about the spaces between the buildings? Probably not, and you're not alone. That’s may be because alleyways – in movies, and sometimes in real life – are usually shady, dirty and even dangerous places. But some local leaders want to bring the city’s alleys back into the light.